In 1968, John Watson was selected as editor of Wayne State University’s Daily Collegian, which he changed to the, “South End,” in recognition of Wayne State’s location south of General Motors. He turned the newspaper into a resource for radical causes, tackling race and class issues on a daily basis. This included reporting on the wildcat strikes of DRUM and other similar revolutionary actions. Source: Wayne State University South End Newspapers. 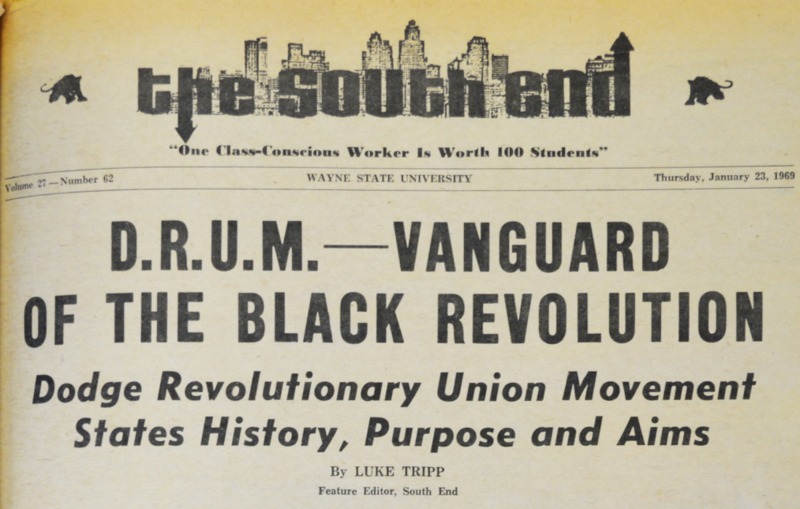 “"The South End" newspaper,” 12th Street Detroit, accessed April 25, 2019, https://projects.lib.wayne.edu/12thstreetdetroit/items/show/380. This exhibit has been created by the Walter P. Reuther Library, Archives of Labor and Urban Affairs, Wayne State University.